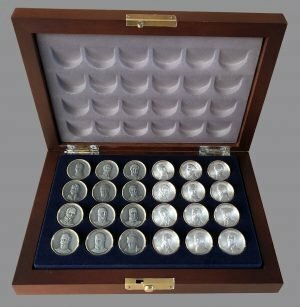 A rare set of The War Machines Chessmen of World War II manufactured by The Franklin Mint. 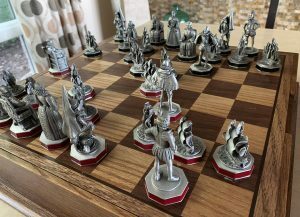 The chess set contains 32 Pewter replicas of aircraft, ships, Canons and Tanks used by the American and German forces during World War II. The surprisingly accurate individual models are mounted atop Pedestals with Red and Blue enameled embellishments. 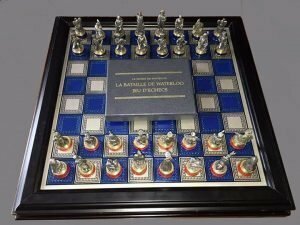 The set of War Machines Chessmen is complete and is in excellent condition. It lacks the original chessboard, the original Certificate of Authenticity and the other associated paperwork. The date of manufacture is uncertain. The American Side consists of the following War Machines.